TBI can manifest clinically from concussion, or mild TBI, to coma and death. While the causal mechanisms of TBI, referred to as the primary injury, encompass a spectrum from minor falls to sports-related head impacts to high-speed motor vehicle injuries, the secondary phase, which occurs immediately after trauma regardless of the cause, produces effects that continue to damage and kill brain cells over a period of hours or days following the initial traumatic assault. How do I get enough omega-3s? Is taking fish oil to prevent a concussion a good idea? Over the past decade, in large part to ingenuity and necessity of military surgeons, tremendous advances have been made in acute and surgical management of severe TBI. Unfortunately, the management of mild TBI and concussions hasn’t changed in centuries! Management of headaches, pain, and sleep disturbances has not changed. See your healthcare provider who may prescribe medicine if you have symptoms such as a headache, difficulty sleeping, or depression. These things are important! However, no current therapies address either the secondary phase that continues to damage the brain over the hours and days following injury or the need to facilitate the early neuroregeneration process to help the brain repair any damage. Dr. Michael Lewis is pioneering methods to rebuild the injured brain rather than masking of symptoms with pharmaceuticals. In addition, Dr. Lewis advocates increasing the resilience of the brain to withstand injury so those at significant risk may be protected. No current management or treatment addresses the underlying situation. The brain is made of fat. About 30% of the weight of the brain is a particular kind of fat called omega-3 essential fatty acids. They are essential because they are required for optimal health but cannot be produced by the body and must be consumed in our diet. Omega-3s, Decosahexaenoic Acid or DHA in particular, are in integral part of the brain cell wall. Omega-3s are well known to be healthy for the heart and brain – so much so that DHA is added to 100% of all infant formula in the United States. Dr. Lewis made a basic assumption: if omega-3s are essential to the growth of the infant brain and can be effective in maintaining or improving mental health, then surely they must be important to help the brain heal when it is injured! There is no cure for concussion and TBI. There are no magic medicines nor will there ever be. The brain has to heal itself. All we can do is optimize the conditions to help the brain do the healing. That is what using omega-3’s will do. It provides a tool, the basic building block, for the brain’s healing. It would be great if we all ate enough foods high in omega-3s, but we don’t. The problem is that omega-6 fatty acids are even more abundant in nature and in our food supply. While omega-3s are anti-inflammatory, increase circulation, and enhance the immune system, omega-6s promote inflammation, increase blood clotting, and depress the immune system. Humans have evolved consuming a diet that contained approximately equal amounts of omega-3 and omega-6 fatty acids. About 100 years ago, the industrial revolution introduced technology that allowed for the refining of vegetable oils and processed foods which led to a dramatic increase in the consumption of omega-6 fatty acids. In addition, the introduction of animal feeds derived from grains rich in omega-6 fats has resulted in the production of meat, fish, and eggs high in omega-6 fats and virtually void of omega-3 fats. Today, in Western diets, the ratio of omega-6 to omega-3 fatty acids ranges from 20:1–30:1 instead of the pre-industrial range of 1:1–2:1.5. Research has shown this imbalanced intake of omegas is a contributing factor to many chronic health conditions such as heart disease, diabetes, arthritis, depression, asthma, allergies, and obesity. Now Dr. Lewis is saying that this makes the brain more susceptible to concussion and TBI and hurts the ability of the brain to heal itself. How do I get enough omega-3s? How much should I take following a concussion or TBI? While it would be great if the typical American ate fish high in omega-3s like anchovies or sardines three-five times a week, but that probably isn’t going to happen. Diet is not enough. The best way to bring our bodies back into balance is to take a high-quality, purified fish oil supplement with the omega-3s we are missing most: eicosapentaenoic acid (EPA) and decosahexaenoic acid (DHA). 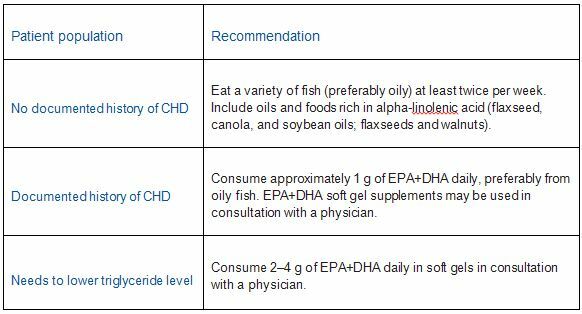 Dosing is based on the amount of EPA+DHA in a product, and not on the total amount of fish oil. Supplements vary in potency and the percentage of EPA and DHA in the oil. Experts recommend 500–1000 mg EPA+DHA per day just to avoid deficiency. Therapeutic doses of EPA+DHA range from 1 to 4 grams. To support the body’s anti-inflammatory response, clinical studies suggest a minimum of 3 grams of EPA and DHA with some studies using 10 grams or more. The American Heart Association’s recommendations on dosage follow. Dr. Lewis, in his clinical experience dealing with TBI and other brain injuries (e.g., stroke), has found that results can be achieved in starting with substantially higher doses for the first week or two and tapering down to more routine therapeutic doses. In short, YES!!! Promising research and evolving clinical experience now indicate that omega-3s are useful and effective for recovery following TBI and concussion. More exciting is that new laboratory research shows the beneficial effects extend to when omega-3s are given prior to injury. Given the safety profile, availability, and affordability of omega-3s, it should be considered a beneficial supplement for the athlete and soldier, not only for its general health benefits, but particularly for those at risk or high exposure to brain impacts. Based upon current knowledge and experience, we believe omega-3s should be consumed at already FDA-approved doses of 3–4 g of EPA+DHA daily in soft gels daily (5 capsules of quality concentrated fish oil) to increase the resiliency of the brain to withstand injury in addition to use if injury should occur.